i`ve selected 8 projects to share with you. Insolita Studios / Level Up! 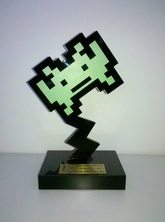 Best Brazilian game at 2012 EGW Awards. You can create your character with Mauricio de Sousa's art style and explore a world full of adventures with Chuck Billy 'n' Folks (Turma do Chico Bento, in Portuguese) on this social game! The game concept is deeply based on the IP's power, which completed 50 years in 2012, and because of that goes far beyond the traditional social farm games, showing fun stories, a lot of scenarios and minigames. The game reached 2 million MAU (monthly active users). I was the responsible of communication between Insolita Studio, the publisher Level Up! and the licensor Mauricio de Sousa Produções. 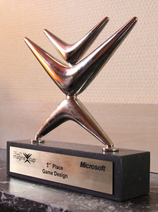 Game Design's world champion of Imagine Cup 2011. You wake up from a nightmare and realize that the world needs your help. To help the city you can perform small actions like collecting garbage, and big ones, like building schools, to prevent and correct natural and social issues, like epidemics and illiteracy. By doing this you mobilize volunteers to help you in your mission. UCAN was the Game design's world champion of Imagine Cup 2011, in New York. Deliver a great game is not enough to win the Imagine Cup. The jury was composed by respected professionals from game industry, like Tetsuya Mizuguchi and Tracy Fullerton. Because of that, we've created an awesome presentation to show all the good points. Gol's costumers are arriving at airports to the World Cup in Brazil and you need to answer them quickly, before they go out unsatisfied! Balance fun and teaching is the biggest challenge of any serious game and this game deliver this kind of quality for 18 thousand of Gol's employee. During the 23 levels the player find a casual and fun gameplay, where costumers need to be dragged to Gol's employees. I was the responsible of the contact between the client and the studio, aligning all the time the stakeholder's satisfaction. Play Texas Hold’em online multiplayer with the NetCartas style, Brazilian leader on this segment, with fun visuals and addictive mechanic. I've splitted the Product owner role with the game designer, taking important decisions about gameplay, interface and any other issue to ensure a great game. You need to manage a big merchandising team on this strategy game of Mondelez, solving issues of the coordinators' routine. In serious game industry is necessary deliver with the game some report to the HR team analyze the users' performance. On this project the client asked for a very complete report, that showed every action of users. The HR team talked monthly with all employees with bad results to help them. The Ironman Netshoes game purpose a quiz with fun aspects, where the employees answer topcis about the company in 4 sports: running, cycling, swimming and soccer. Our client's vision was something so funny than recent successful quiz games, like QuizUp and Trivia Crack. In the other hand we had a small budget, that made it impossible to develop multiplayer features. Then we took care of the small detais of art, audio and gameplay to deliver a funny game. In the end, we really laughed with the animations of falling. Control a heartbeat in this endless rhythm game! Get pulses to keep on going for as long as you can, but don’t beat off the rhythm or you will be BEATen! The project was finalist of 2013 SBGames' Game Festival. Port the gameplay from PC to mobile was a really task, to maintain all the fun aspects of PC version and explore all the new discoveries in mobile. The game stays in development. On this ludic universe you will find medieval scenarios and fantastic characters, like unicorns, orcs, minotaurs, giants and ghosts. Shadow of Light is a MMORPG that purpose deep character evolution and innovative mechanics of PvP combat. The company committed the most common mistake of start-ups: begin with a high complex project, like a MMORPG. After 1 year and half the project was cancelled because of budget and I've realized how important is the project manager role. 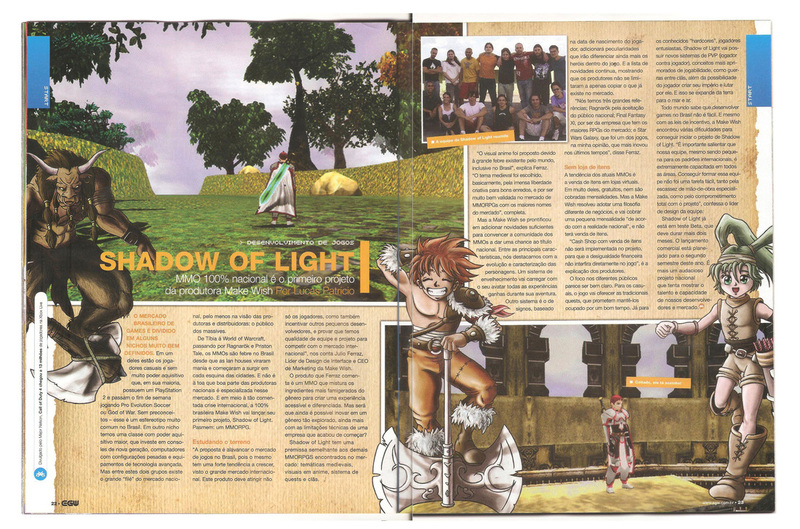 Story on EGW magazine, biggest videogame magazine in Brazil.